Anne Donovan was born November 1, 1961 in Ridgewood. She and her older sister, Mary, were exceptional basketball players in youth leagues and junior high. Anne stood 6–1 when she entered Paramus Catholic High School. She eventually grew to 6–8 and led the Paladins to two undefeated seasons and a pair of state championships. Anne was named the National Player of the Year in 1978–79, after she averaged 25 points and 17 rebounds a game. Given her pick of colleges (she was a solid A– student) she accepted a scholarship to Old Dominion University, a school with a great women’s basketball heritage. Anne was one of the youngest players on the winning US team at the 1978 and 1979 Olympic Festival tournaments. Sadly, Team USA did not go to the 1980 Olympics because of a boycott. That disappointment was tempered by the AIAW national championship she won in 1980. In the title game against Tennessee, she swatted 10 shots and pulled down 17 rebounds. The Lady Monarchs failed to repeat as champions during the next three seasons. However, Anne capped off her senior year with her third straight All-America nomination. She also became the first female recipient of the Naismith College Player of the Year Award. She averaged a double-double for her career—with more than 20 points and 14 rebounds per game—totaling 2,719 points and 1,976 rebounds. In 1983, Anne was also a member of the gold-medal national squad at the Pan Am Games. Anne got her first taste of Olympic glory in 1984. Among her teammates on this the national squad were Cheryl Miller, Teresa Edwards, Pam McGee, Janice Lawrence and Lynette Woodard. They cruised through the tournament, beating South Korea 85–55 for the gold medal. In 1986, Anne’s play against 7–2 Ivilana Semenova sparked two amazing victories for team USA over the powerhouse Russians. The US Olympic team repeated its gold-medal performance in 1988, with Anne among the squad’s top players. During this time, Anne played pro ball in Asia and Europe. 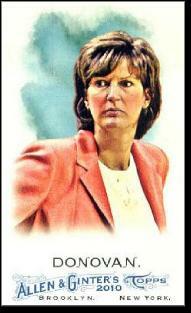 In 1989, Anne took an assistant’s job at ODU, beginning her long coaching career. She became a head coach at East Carolina in 1995. That same year, Anne received the honor of being inducted into the Basketball Hall of Fame. Four years later she was in the inaugural class of inductees at the Women’s Basketball Hall of Fame. When the WNBA got going in 1997, Anne was well past her playing days, but she was on everyone’s short list for coaching jobs. After leaving ECU in 1998, she was a fixture on the WNBA sidelines for more than a decade, leading the Indiana Fever, Charlotte Sting, Seattle Storm and New York Liberty into battle. In 2004, the storm won the WNBA championship. Sue Bird, Lauren Jackson and Betty Lennox were her top players. That year Anne also served as an assistant on the Olympic team. In 2008, Anne was named head coach of the US Olympic team. She guided the women to a gold medal, becoming the first woman to win gold as a player and coach. Prior to the 2010–11 college season, Anne was named head coach at Seton Hall. She still lives in Bergen County.